The skin on our necks is thinner than the skin on our faces and it’s exposed to the same wear and tear. So what are you doing about your neck? You have your anti-aging skincare routine down to a science, you never leave the house without wearing vitamin c serum and sunscreen, and at night you refuse to let your face touch the pillow without applying under-eye treatment and moisturizer. But what are you doing about your neck? Americans spend so much effort preventing signs of aging like creasing and wrinkling in the space between their chins and foreheads. In reality, the neck often starts to look older long before crow’s feet enter the picture. The skin on our necks is thinner than the skin on our faces and it’s exposed to the same wear and tear. Unfortunately, it also tends to get a lot less TLC, if any at all. “Over time, skin loses collagen and elastin,” says New York City plastic surgeon Benjamin Paul, MD. Dr. Paul explains smoking and sun damage can also further accelerate aging of the skin on the neck. Those aren't the only causes of neck aging. 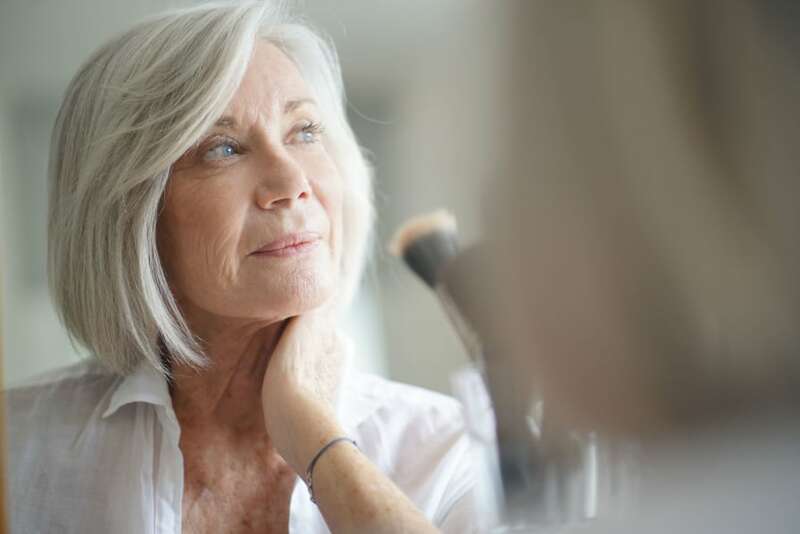 As we get older, laxity in the neck occurs due to a loss of support from connective tissue and muscle. This leads to what we commonly call a “waddle” or “turkey neck" and looks like loose skin under our chin. The appearance of sagging skin on the neck can affect everyone. Repeated pulling of the platysma muscle, which is the muscle men often flex while shaving, tugs on the overlying skin and causes it to wrinkle over time. According to Dr. Paul, thyroid or neck surgery also loosens the neck and can contribute to an older appearance. While there’s not much we can do about getting older, it is possible to slow down the physical signs of aging. Here are some ways you can prevent future sagging skin and promote a younger-looking neck. It’s common knowledge that sun exposure causes major damage to your skin. This includes the delicate skin on your neck, which is one of the first places the signs of aging can take hold. According to Dr. Paul, the single best thing you can do to preserve a youthful neck and prevent sagging skin, age spots, and fine lines is to wear sunscreen. The American Academy of Dermatology recommends an SPF of at least 30 because it blocks 97 percent of the sun’s damaging UVB rays. Apply sunscreen to your face and neck every morning before putting on your makeup, whether you’re spending the day indoors or outside. Remember to reapply every few hours to make sure your skin is always protected. It can be challenging to treat sagging skin with topical products alone. At the same time, many patients are hesitant to go under the knife to correct loose neck skin. Luckily there are several professional skin tightening options that can give them the results they desire without surgery. “Radiofrequency and ultrasound devices aim to tighten the neck with energy,” says Dr. Paul. The treatments have been shown to tighten loose neck skin by using energy to heat the skin and boosts the production of collagen and important proteins. However, Dr. Paul cautions that the effects of these devices is limited and patients may need multiple treatments to see results. We know lasers can reduce unwanted hair and remove tattoos, but these incredible devices can also be used to rejuvenate the skin and promote a more youthful look. Laser resurfacing involves directing short, concentrated, pulsating beams of light at the face or neck to remove damaged skin layer by layer. If you have dark spots on your neck, you’re looking at the results of sun damage. Luckily, you don’t have to live with age spots forever. Intense pulsed light therapy (IPL) is similar to a laser treatment in that it uses energy to treat wrinkles, dark spots, and sun damage. But it’s different because it releases many different wavelengths of light, so is more scattered and less targeted. During an IPL treatment, pigment in the skin absorbs the light, which is converted to heat. The heat then destroys the unwanted pigment to fade the appearance of red and brown spots. According to Dr. Paul, it may take between three and five IPL treatments to see results. As if breakouts weren't bad enough, acne scars can haunt you your entire life. Acne scars and marks come in many forms, but the one thing they have in common is that they are long-lasting. Fortunately, most acne scars and marks can be effectively treated with some TLC and a little help from your doctor. We spoke to West Hollywood plastic surgeon Dr. Roger Tsai, MD to get his expert advice on the best ways to treat them and leave acne in your past. Topical Serums/Creams: One popular topical solution is Saromae Snail Serum which has been known to heal scars for hundreds of years.Tsai also recommends skin exfoliation creams and retinoids, like Tretinoin, and skin brightening products, like Hydroquinone, to help quicken skin turn over for some patients. Several of our SMD Cosmetics products contain these ingredients. The Saromae Collection specifically addresses these concerns. Acne scars are caused when the healing process replaces skin tissue with fibrous tissue instead. "Acne scars are actual indentations created from scar tissue that has grown into the empty space of the pimple and has created a contour deformity,” says Dr. Tsai. Sometimes the body can respond by producing too much of the fibrous tissue or not enough. When too much tissue is formed, the result is a raised keloid or hypertrophic scar. On the other hand, when not enough tissue is formed, the result is a depression in the skin, known as an atrophic scar. Because scars form for different reasons, there are different treatment protocols for each type. In general, compared to acne marks, acne scars are more permanent and harder to treat, although their appearance can be softened with certain acne treatments. Rolling scars are shallower than ice pick scars and boxcar scars and have more of a “rolling hills" appearance, meaning they don't look like punctures. Treatment includes a combination of microfat injections and microneedling with platelet-rich plasma (PRP). They say beauty is in the eye of the beholder. What one person sees as attractive is often completely different than what someone else thinks. This is especially true when comparing the specific ideals of female beauty across different countries. The beauty standards set by the society we live in have tremendous influence on the styles and trends we are drawn to. The desire for a milky, smooth complexion is also popular in other parts of Asia, including South Korea. While pale skin was originally a signifier of wealth and prestige, the desire for white skin is now associated with youthfulness. The first signs of aging on Asian skin is pigmentation, not wrinkles, so men and women use beauty products with whitening agents to appear as light and ageless as possible. These beauty products, known as K-beauty in the global market, are focused on health and hydration (we can thank South Korea for sheet face masks). It is about nourishing your skin so you look incredible with little to no makeup. Korean beauty consumers favor a dewy, glowing complexion with textured, yet natural eyebrows. Beauty trends lean towards soft, earth toned eye shadow and natural lips with lightly tinted color. The most popular plastic surgery in Brazil is liposuction, which is closely followed by breast augmentation. Abdominoplasty (also known as tummy tuck) and breast lift round out the top procedures in the country. The popularity of these body-sculpting surgeries is telling. Brazilians feel extreme pressure to have a perfect figure they can flaunt in a bikini. Women are even going as far as to have liposuction of the toes in pursuit of a flawless body. Have you ever heard you are what you eat? Of course! Obviously eating well has many advantages to your energy level, your weight, your mind, but also your skin. If only it was so easy that all we had to do was put great skin care on our skin and that's the end of the story. Your skin is the largest organ of your body. And its health is easily influenced by what you eat. Skin goes through many cycles of renewal and repair. Proper nutrition supplies your skin with the materials it needs to maintain its beauty and strength. That means eating a variety of healthy, whole foods that include a wide range of vitamins, minerals, antioxidants, lean proteins, and omega-3 fatty acids. Here's a few things to watch for when you are thinking about what to put into your body. Vitamin C: Healthy skin requires a good supply of the protein collagen. This peptide is the most abundant protein in your body and is found in connective tissue and skin. Collagen gives your skin elasticity, bounce, structure, and durability. Your body needs Vitamin C to regulate the amount of collagen produced in your skin. Vitamin C stabilizes the genetic blueprints for collagen production and increases the rate at which it is made. This helps keep your skin looking as firm and healthy as possible. Fatty Fish: such as salmon, mackerel and herring, are excellent foods for healthy skin. They are rich sources of omega-3 fatty acids, which are important for maintaining skin health. Omega-3 fatty acids are necessary to keep skin thick, supple and moisturized. In fact, a deficiency in omega-3 fats can cause dry skin. Avocados: are high in healthy fats. These fats benefit many functions in your body, including the health of your skin. Getting enough of these fats is important for keeping skin flexible and moisturized. Walnuts: a good source of essential fats, zinc, vitamin E, vitamin C, selenium and protein, all of which are nutrients that your skin needs to stay healthy. Sunflower Seeds: an excellent source of nutrients, including vitamin E, which is an important antioxidant for the skin. They also contain linoleic acid, a type of fat that may prevent dry and thin skin. Sweet Potatoes: an excellent source of beta-carotene, which acts as a natural sunblock and protects the skin from sun damage. Bell Peppers: contain plenty of beta-carotene and vitamin C, both of which are important antioxidants for the skin. Vitamin C is also necessary to create collagen, the structural protein that keeps skin strong. Broccoli: is a good source of vitamins, minerals and carotenoids that are important for skin health. It also contains sulforaphane, which may help prevent skin cancer and protect the skin from sunburn. Tomatoes: are a good source of vitamin C and all of the major carotenoids, especially lycopene. These carotenoids protect the skin from sun damage and may help prevent wrinkling. Soy: contains isoflavones. Isoflavones have been shown to improve wrinkles, collagen, skin elasticity and skin dryness, as well as protect the skin from UV damage. Dark Chocolate: Cocoa contains antioxidants that may protect the skin against sunburn. They may also improve wrinkles, skin thickness, hydration, blood flow and skin texture. Green Tea: The catechins found in green tea are powerful antioxidants that can protect skin against sun damage and reduce skin redness, as well as improve the hydration, thickness and elasticity of skin. Are we seeing a pattern here? Yes things that grow, are natural, and come from the earth...maybe dark chocolate had a little help but you get the idea!